The 2014 Inshore Regatta at Marina was a tremendous success as ever. Please have a look at the 3 photos galleries we have added to see some of this years action. Photos were taken by Matt Ridgeway, Abi Willson. Click on ‘Gallery’ at the top of the page to view the photos. 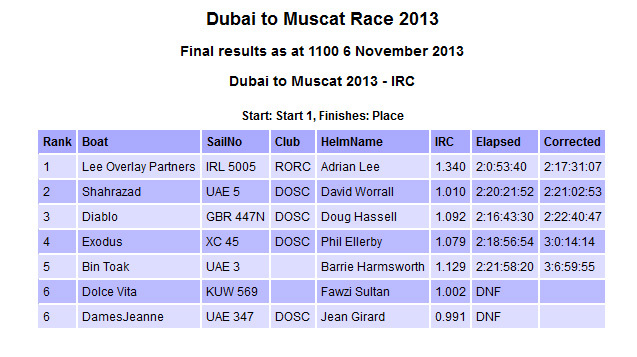 The results for the 2013 Dubai to Muscat SARF race have been announced. Lee Overlay Partners with Adrian Lee at the Helm took first place with a corrected time of 2 days 17 hours 31 min 7 secs. 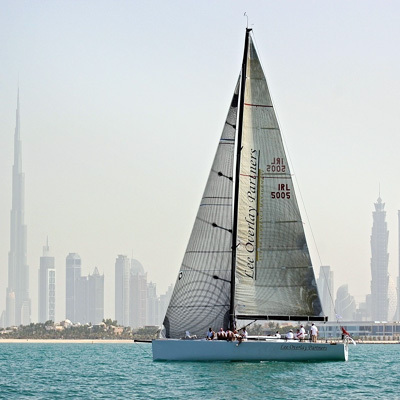 Adrian Lee’s Cookson 50, Lee Overlay Partners, has claimed line honours for the IRC Racing Division in the 2013 Dubai to Muscat Race, sponsored by Xtra-Link. The Irish canting keel racing yacht crossed the finish line at Muscat on Tuesday, 5 November at 11:58 40 seconds (local time). Lee Overlay Partners elapsed time for the race was 2 Days 53 Mins at 40 Secs, setting a new course record for the 360-mile race. Adrian Lee was full of praise for his crew, after breaking the monohull record for the longest offshore yacht race in the Arab region that has lasted for 13 years. 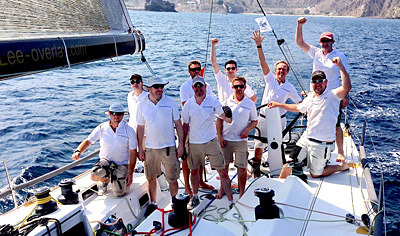 Lee Overlay Partners for the Dubai to Muscat Race: Adrian Lee, James Hemingway, Ilya Lee Paveliev, Scott Wilson, Emmet Kerin, James Gunne, Tim Corney, Neil Harrison, Ruairi Herraghty Robert Witte and Daniel McKeown, who took the photo as the team crossed the finish line. 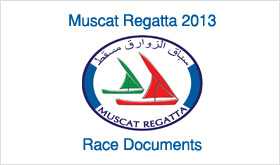 The 22nd Dubai to Muscat Race is organised under the auspices of the Royal Ocean Racing club. HH Sheikh Khaled Bin Zayed Al Nehayan was the guest of honour for the start. 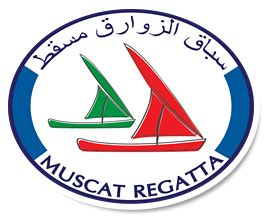 The 360-mile race is the longest offshore yacht race in the region and is organised by The United Arab Emirates Sailing and Rowing Federation in association with the Ministry of Sports Affairs, the Sultanate of Oman. The monohull record for the longest offshore yacht race in the Arab region looks set to be broken. The record has stood for 13 years. Yesterday afternoon, the wind speed picked up significantly in the Gulf of Oman, propelling Adrian Lee’s Cookson 50, Lee Overlay Partners at record breaking pace. Race Organisers, GWM Racing have reported that 3 yachts have retired with all the crew safe and well. Fawzi al Sultan’s Kuwaiti team on Dolce Vita put into port just after Ras Al Khaimah and the Emirates team on Adel Lootah’s Jadi made safe haven at Fujairah. 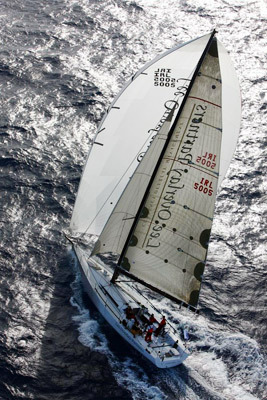 The monohull record for The Dubai to Muscat Race was set in 2000 by Twister, skippered by Marco Graziano. In strong winds and a significant sea state the UAE registered J/105, Twister was often sailing with just a heavily reefed mainsail and completed the course in 2 days 3 hours 52 mins 31 secs. Lee Overlay Partners need to finish the race by 14:52 and 30 secs to become the first overseas yacht to hold the record for 13 years. Today at 0940 local time, Lee Overlay Partners was 20 miles from the finish but the wind speed was dropping dramatically. Eric Laing’s Beneteau 57, Yours Truly was the first yacht to finish the race in the Club Class. 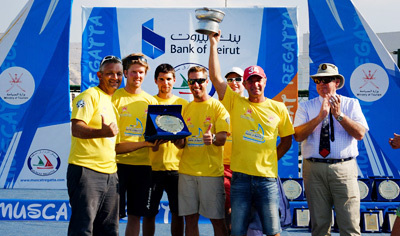 Finishing in the early hours of this morning, the UAE based team have won the class for the second year in a row. 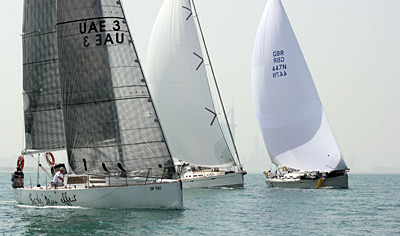 The 22nd Dubai to Muscat Race is organised under the auspices of the Royal Ocean Racing club. HH Sheikh Khaled Bin Zayed Al Nehayan was the guest of honour for the start. 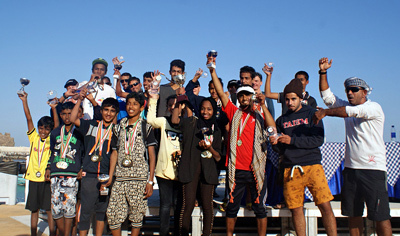 The 360-mile race is the longest offshore yaht race in the region and is organised by The United Arab Emirates Sailing and Rowing Federation in association with the Ministry of Sports Affairs, the Sultanate of Oman. 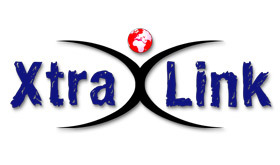 For regular updates including satellite tracking of all of the yachts, click here. After a perfect start in Dubai, the IRC Division of the 22nd Dubai to Muscat Race, sponsored by Xtra-Link, is well under way. 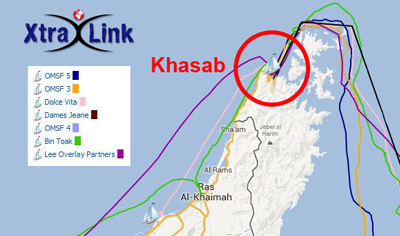 The front runners passed Ras al-Khaimah during the night and are approaching the Strait of Hormuz. Irish Cookson 50, Lee Overlay Partners has enjoyed a spectacular reach along the Arabian Gulf, as Adrian Lee explained via Thuraya Satellite phone. This morning, Lee Overlay Partners is back up to full speed. Just before dawn, the Irish Cookson 50 tacked onto Port to lay the Strait of Hormuz and the breeze seems to be lifting the overall towards the strait with a boat speed in excess of 8 knots, the leader should past through to the Indian Ocean this afternoon. Lee Overaly Partners’ closest rival on the water is the hi-tech XS35 catamaran, Blackwater with a team from Southern California, skippered by Matt Vukelich. Meanwhile the bulk of the fleet opted for the inshore option and suffered from the decision. Doug and Claire Hassell’s First 44.7, Diablo made great gains on the first day, at one point the British team was ahead of Lee Overlay Partners. However, as the breeze faltered at dusk, Diablo’s progress slowed. On the water Diablo is now over ten miles behind Lee Overlay Partners but racing under the IRC measurement system, Diablo was the leader after time correction. The wind looks to be shifting to a north easterly direction today, which means that Lee Overlay Partners are gaining from the change, whilst yachts inshore have got the wrong side of the shift. Jean Girard, sailing Two-handed with his wife, aboard First 34.7, Dame Jeanne looks very well placed after IRC time correction and also well placed offshore to take advantage of the shift. Today, the Dubai to Muscat Race will enter a crucial stage. 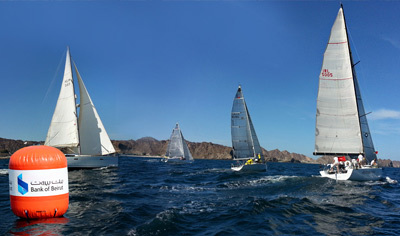 Weather forecasts predict building breeze in the Gulf of Oman. However to get to the fresh wind, first the fleet must pass through the Strait of Hormuz. The narrow gateway to the Indian Ocean is notorious for ocean currents and squalls and the scenery is breathtaking. The rugged fjords of the Mussandam Peninsular, south of the Strait of Hormuz, are often described as the Norway of the East.